The spinner will select between two languages, English and Tagalog and update the user interface in real time. When the button is pressed it will display a message in the selected language. Below the send button will appear the message that has been sent when the Send button is pressed. 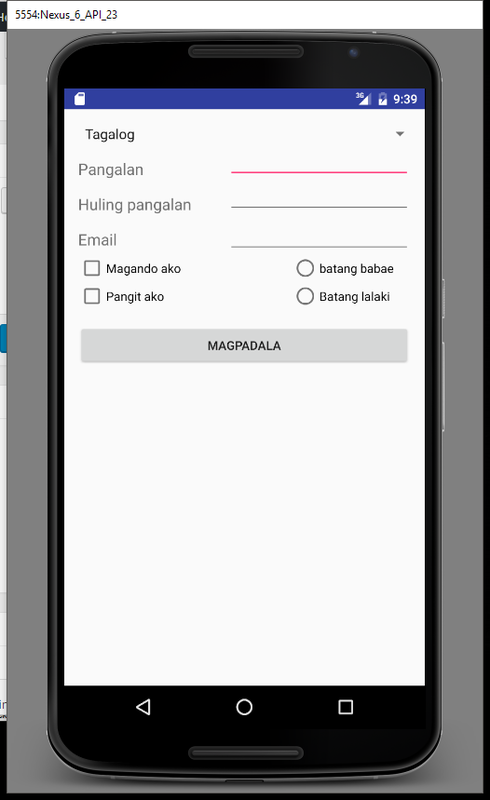 You can now update the relevant files in the project with the following and make sure you update the Tagalog translations in manifests\AndroidManifest.xml file. The first file is the AndroidManifest.xml file. This one remains fairly standard as created. Next we create the layout. You can do this in two ways, one using the visual editor and dropping the controls where you want them or copy/paste the following into the activity_ask_perf.xml file. If you do choose the first option, you will need to make sure you name the controls as per the file here so the rest of the application will work. Now the fun begins. We create the code that actually makes things work. First step is to make sure all the imports are included. I’d probably suggest copying that section from the listing below first. You will notice that the class is not quite the same as the default class that Android Studio created for you. This one extends Activity and it implements OnItemSelectedListener. This is part of the Spinner control.